Here's the scenario, your an American born Filipino kid with immigrant parents from the Philippines who tricked you into eating chocolate meat. Your dad has a friend who eats an undeveloped duck embryo in front of you that totally grosses you out and tells you it gives him some kind of super power to please women. They tell you folk tales of superstition they grew up with in the Philippines. Stories of little people running around in the jungle and huge vampire bats flying around looking for little kids to eat in the night. Now you feel somewhat apprehensive and curious at the same time. You feel like you never want to go to the Philippines but want to learn as much as you can about it. You ask your white friends about these stories and they think you're talking about Halloween or something. Somewhat confused about your Filipino identity you search for stories your parents and relatives told you about, there’s nothing. You get the impression that being Filipino is insignificant and you want to favor your American identity. Now you feel like you want to shred everything about being Filipino. You stay out of the sun hoping your skin turns lighter also something your mom reinforces. You apply whitening lotion and a clothes pin to your flat nose before you go to bed. When you wake up you look in the mirror hoping your nose is getting pointy like your white friends and all you see is a clean brown face with pinch marks on your flat brown nose when you wake up the next day. That was sort of my way of describing how I felt growing up in America and then I remembered the schoolbooks she kept in her footlocker. 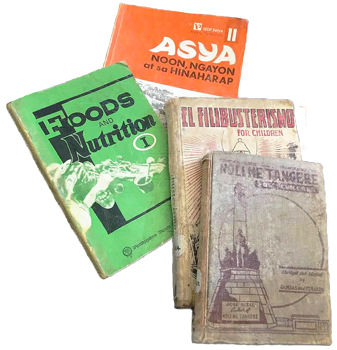 Rummaging through mama's footlocker I remember she had a history book, a nutrition cooking book, and a couple of novels, Noli Me Tangere and El Filibusterismo originally written by Dr. Jose Rizal and rewritten in a study guide format for elementary children. Required reading for all Filipino kids. I was more interested in the Asia History book and when I opened the book it was written in Tagalog. So I went online and translated some of the titles and found what I was looking for. I wanted to research the history she was learning and how it differed from the history I was taught in America. I was not disappointed.